When it comes to the holidays, Crystal Cruises does it right, and on our Thanksgiving cruise aboard the Crystal Symphony, we got a taste for turkey as well as Christmas. For Thanksgiving day, we were anchored off the island of Santa Catalina — only twenty-six miles across the sea from California — as the song goes, and while many shops were closed up on shore, the luxury ship was hopping for the holiday. 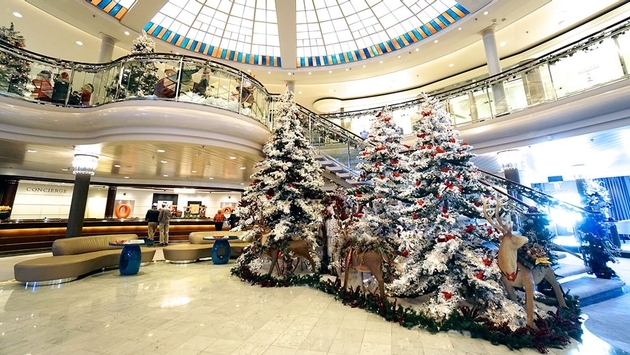 All throughout the sailing, we saw the ship transformed from its usual beautiful self to a winter wonderland as more and more Christmas decorations were installed, but that didn’t preempt Thanksgiving. A religious service of Catholic Mass was performed in the morning, and NFL football games were broadcast for sports lovers, but it was all a lead-up to a Thanksgiving feast in the Crystal Dining Room. White Sturgeon Caviar and a Crabmeat Tower were unexpected appetizer options for seafood connoisseurs ahead of fall flavors like Butternut Squash Bisque or Pumpkin Gnocchi, that could be enjoyed as a starter or an entree. Of course, the main event on the menu was the delicious Maple Brined Whole Roasted Turkey with cider-thyme gravy, orange-sage stuffing, sweet potato praline with pecan streusel, creamy peas and onions, and cranberry-peach chutney. Alternatively, Spice-Smoked Ham was available, or you could enjoy both as I did. Pumpkin Pie and Pecan Pie were then traditional sweet desserts to finish with. Christmas will soon be here, and I recall the holiday aboard the since retired Crystal Harmony as a young kid back in the day. There were only a few dozen children on the ship at the time, still lots more than usual for the luxury line, but that didn’t stop it from pulling out all the stops even then. In true maritime fashion, Santa Claus arrived by tender, and I remember actually going outside to the promenade deck to see the red-suited, white-bearded man step off onto the teak wood. From there, he made it to the Palm Court observation lounge to give every child a gift from his velvety bag. I believe it was some stand-alone electronic video game of a recent Disney film that I was given and enjoyed for some time thereafter. Theatrical as they may be, my longterm and recent memories onboard Crystal for the holidays are magical ones, and I appreciate how the cruise line has not cut back at all on its Thanksgiving and Christmas flair over the years.